The skin of babies and infants is thinner than the skin of adults and the protective function is not yet sufficient – it thus needs special attention. The hydro lipid layer has a low content of fat and the protective acid mantle is still unstable. The skin’s pH value at birth ranges at 6.5 and decreases to the acid range within the first weeks. Mild products are important already for cleansing. To avoid skin irritation, daily bathing or excessive cleansing of the baby is generally not recommended. The nappy area is of course an exception and needs to be gently and thoroughly cleansed from all impurities. Leave your baby’s bottom exposed to the air as often as possible and only put the fresh nappy after the skin has totally dried. Daily care of baby’s and children’s skin with suitable creams or lotions is also recommended in case of normal skin but especially in case of dry skin with particular attention to all highly stressed skin parts or those which are frequently cleansed (nappy area, face, hands). High quality care products maintain or restore a sufficient content of lipids and moisture. 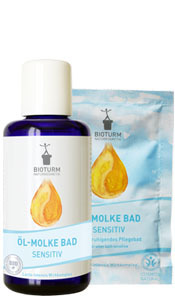 Also for the sensitive skin of babies and children, BIOTURM cleansing and care products offer perfect protection. They combine the special lacto-intensive active complex and its skin-like components with precious vegetable oils and highly concentrated plant extracts. The lacto-intensive active complex ensures normalization of the skin flora and the protective acid mantle and is well absorbed by the skin. Thus already the base of the products is compliant with the skin and very well tolerated. Skin soothing care bath with organic sunflower oil and the lacto-intensive active complex for sensitive and stressed skin!